Bearied Treasure -- discontinued many years ago! 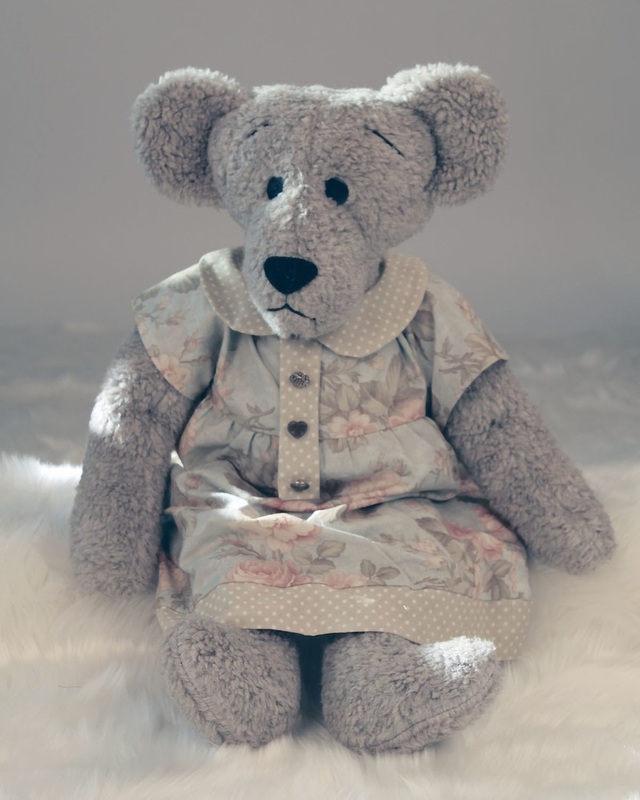 The dress the bear is wearing inspired many of the rectangle dress patterns that are currently in my inventory today. Ideas often get recycled - even if it is years later! Here's one of my booths! 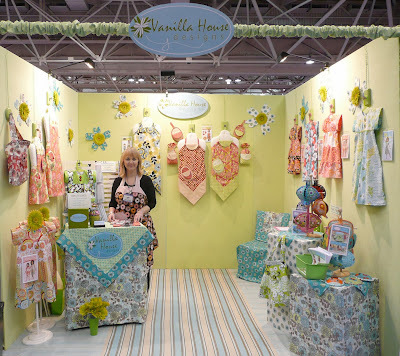 Here's one of my past booths. This is the Market I came out with lots of girls dresses. I have decorator weight fabric for flooring (won't do that again) (had to tape it down then couldn't get the tape off the floor when done! oops!). And stretch fabric over styrofoam core walls. The stretch fabric worked great but getting the walls up and to stay up was challenging. The fabric on the fixtures was Bryant Park by Exclusively Cottons. I will try and track down more booth pics and post them. 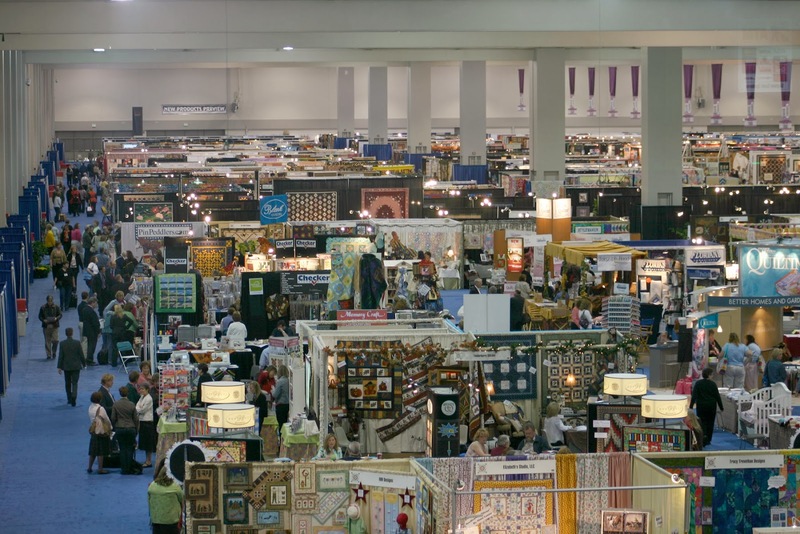 International Quilt Market is in Pittsburgh, Pa this coming May. As soon as January 1st hits, it is time to start getting serious about new releases. We already have four written (rough drafts), our fifth idea is in production, and we would like one, maybe two more. There's still lots to do but generally, we are ahead of schedule. Yeah!! I think this Market was in SLC a few years ago! Why do sewers love cats? Jim also thinks he is photogenic. 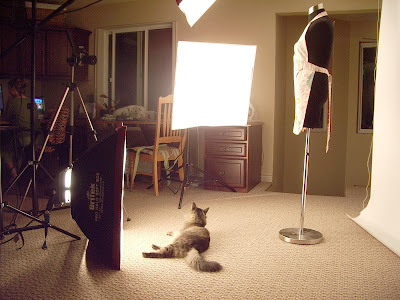 Jumanji loves being under the photo lights, which can be problematic. Once, I swiped my arm to get him out of the way, knocked my camera over, and then proceeded to have a melt down because I thought I broke the camera. Turns out, the camera just seemed to be in shock for awhile and after turning it off and rebooting, it appears to be okay. There are days when this job gets very stressful!! I think he thinks he can type! And probably thinks he can sew too! 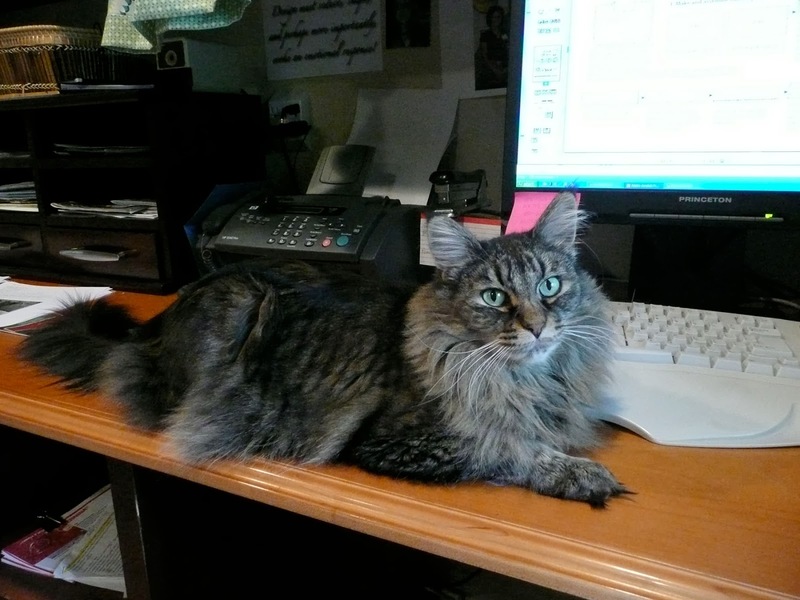 This is Jumanji, Jim for short, our Mainecoone office cat. He really is wonderful to have around. Though those of you with cats know they can often get annoying. Lately, his favorite thing to do is bite my toes while I am working. 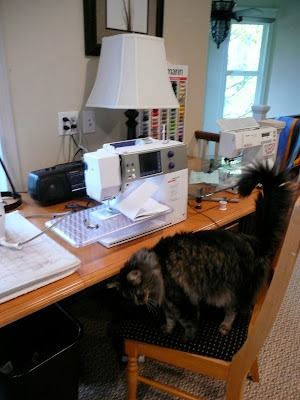 We also have Nabou (some Ragdoll variety), but she is a little camera shy and sticks to her perch on one of chairs, barely moving -- I think she thinks she is a figurine!